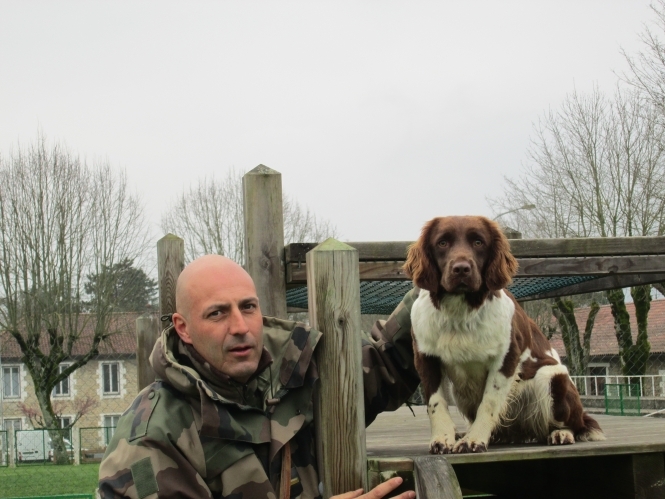 The man in charge of the gendarmerie dog training centre in Gramat in the Lot, Col Dominique Dalier, is quick to summarise why the animals are so important to security and law enforcement. Connexion visited the centre to see how the dogs are chosen and trained for these pivotal roles. The gendarmerie selects dogs from private breeders based on their playfulness and lack of aggression. Those that don’t make the grade are re-homed, any that show aggression are offered to specialist security companies and, in exceptionally rare cases, dogs deemed to be too dangerous to train are humanely put down. “But that’s very rare,” said Col Dalier, sitting at his desk, stroking his dog Crixy’s ears. Around 80% of the forces’ dogs are Malinois, 12% are Belgian shepherds, and the rest are bloodhounds, Ameri­can staffies, springer spaniels, golden retrievers and fox terriers. The dogs are checked for general health and hip dysplasia then start a three-month basic training with the centre’s permanent trainers, learning basic commands such as ‘heel’, ‘sit’ and ‘stay’. They live in the centre’s kennels, which can hold 137 dogs.